EXCITEInnovation is a process, set of tools and way of interacting that is used by diverse groups/teams to collaborate, create and implement unique and breakthrough solutions (products, programs, services). The process includes tolls and methods for true collaboration, key elements of Design-Thinking as well as the critical steps necessary to be “ready to innovate” and participate as True Collaborators. It also includes the critical thinking and planning steps necessary to “Make Innovation Real”. 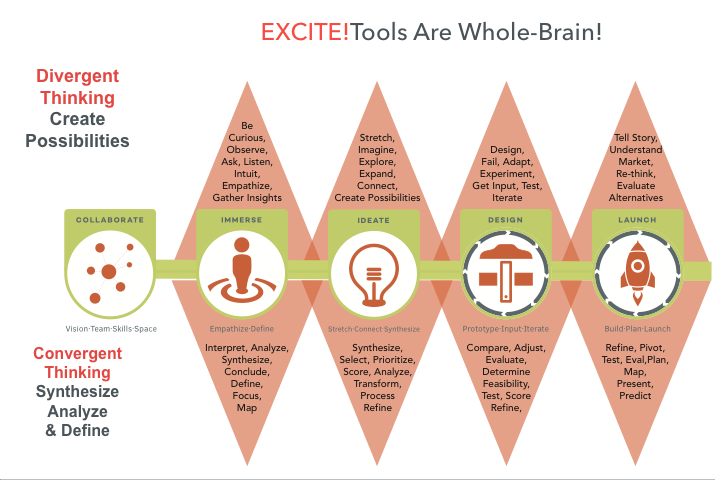 EXCITEInnovation builds Whole-Brain thinking skills as well as critical 21st century skills.